On the question of how the Democrats view Vice President Joe Biden, who is still considering whether he will become a candidate for President, 73% of "Democrats believe his candidacy Biden’s decades of political experience make him an effective leader". Also, 59% believe "Biden can keep the Democratic Party from moving too far to the left"
Now that the Mueller Report has been announced as completed with President Trump and the Republican Party claiming that the report completely exonerates and vindicates the president, doubt is beginning to creep in. 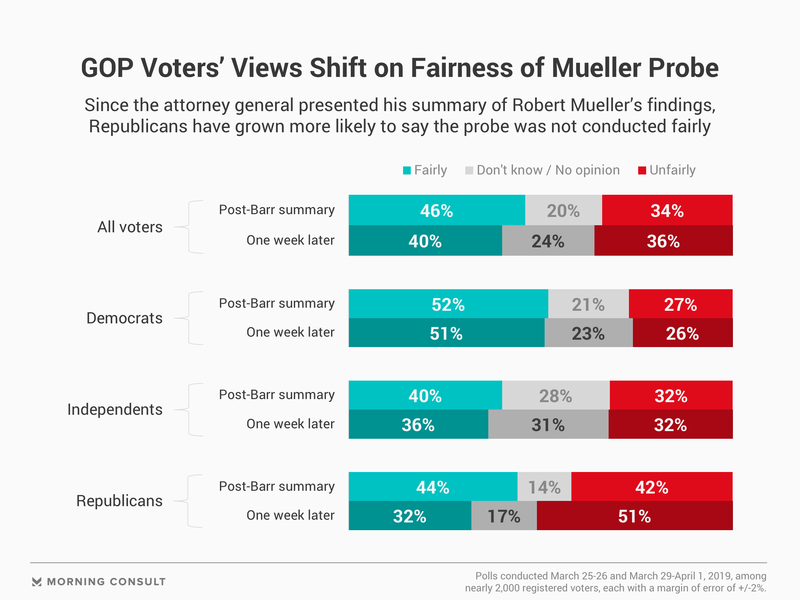 According to the poll, "Since the attorney general presented his summary of Robert Mueller's findings, Republicans have grown more likely to say the probe was not conducted fairly". Democrats have not changed much on the probe.. The survey, conducted March 29-April 1 among 1,945 registered voters, also asked Americans about Joe Biden, the Mueller probe, and more. 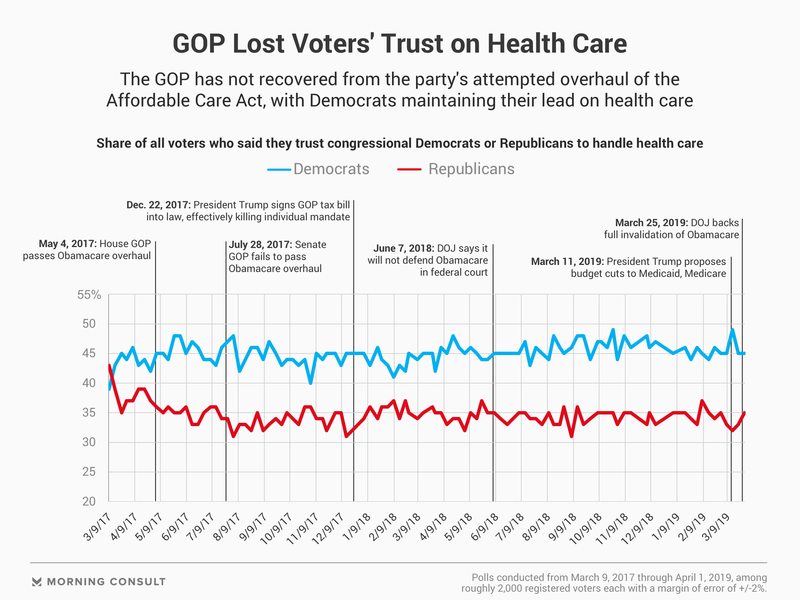 Most voters trust Democrats - not Republicans - to handle health care: Asked how much trust they placed in Trump or congressional Republicans to protect or improve the health care system, nearly 3 in 5 voters said "not much" or "none at all." 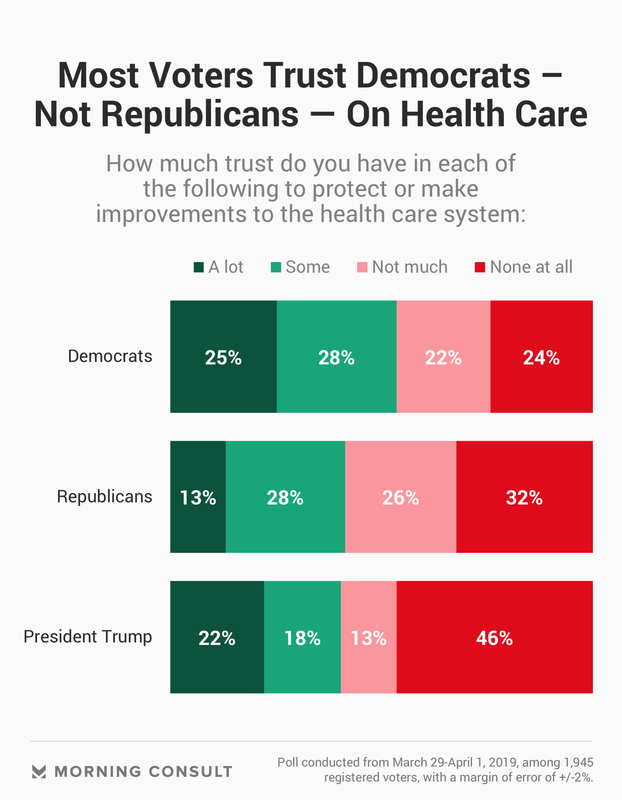 By contrast, a 53% majority of the electorate said they had "a lot" or "some" trust in Democrats on the same question. Biden's winning the age and ideology debate with voters - for now: Nearly three in four Democrats (73%) said his decades of political experience make him an effective leader, and about six in 10 Democrats (59%) agreed that Biden can keep the Democratic Party from moving too far to the left on the political spectrum. There were little differences between Democratic men and women. More than three in 10 Democrats (31%) said they agree that the 76-year-old is out of touch with the challenges that younger Americans face today, compared to 52 percent who disagree. 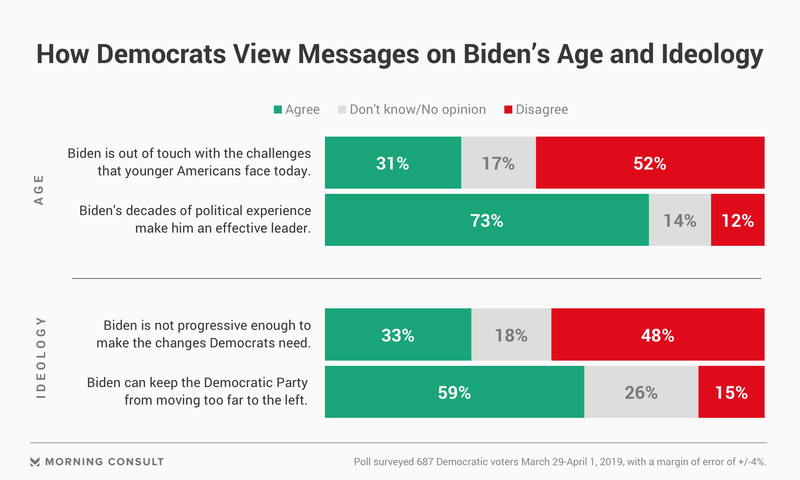 And a third of Democrats (33 percent) agree that Biden is not progressive enough to make the changes Democrats need, compared to 48 percent who disagree. Most voters still believe Russia has compromising information on President Trump: 51% think it's likely that Russia has compromising information on the president, while 40% believe Trump's campaign worked with Russia to influence the outcome of his victory over Hillary Clinton and 46% believe the president has tried to impede or obstruct that investigation. As GOP voters digested more of the news, they've also grown more wary over questions concerning the probe's fairness: A slim majority (51%) say they don't believe the investigation was conducted fairly, compared with 42% last week - and 32% now say it was a fair investigation, down 12 points from the previous poll.